Alarm 9: Eight Dead In Russia Bus Bomb Blast! A bomb has exploded on a Russian bus killing eight people and injuring nearly 50. - Investigators in Togliatti, the city that is the headquarters of Russia's largest carmaker, were trying to determine whether the explosive device was being carried by a passenger or had been planted inside. 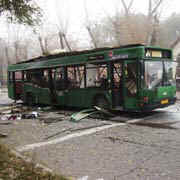 The blast happened at an intersection near a bus stop in the centre of town as people were going to work. A group of college students had got off at the stop just seconds before the blast, and about 20 students were among the injured, according to NTV television. Valery Matkovsky, a local emergency official, said that eight people were killed and 48 injured. In one picture taken by an emergency worker at the scene, the body of one woman could be seen still sitting upright inside the bus. Other pictures showed the bloody remains of victims, with clothes ripped from bodies -- face down in the debris -- and limbs hanging through blown out windows of the devastated bus.